Yesterday, I was able to spend a few luxurious hours at the farm property, walking the 10 acres, and making mental notes of what needs to to happen after we move in. The weather was lovely, and the sweet scent of spring was rising from the field. The Horse Heaven Hills showed a tinge of green. The birds were very busy and vocal, flitting about the trees and the vineyard. Everything was waking. I just wanted to pinch myself, it is hard to believe that this will be our home in a few months. One of the most interesting experiences of the day was looking through old photographs of the homestead. The current owners have gathered a wealth of information about the families that have lived here previously. They have photos from the son of the original homestead builders. It was a bit eerie sitting in the same kitchen browsing through Thanksgiving photos, walking through where kids had played in yard over a hundred years ago, and peering almost shamefully in their private lives and awkwardly posed photos from by-gone years, yet it felt an honor as well. In the photos there is hardly another homestead or tree off in the distance toward the hills. Many of the farm buildings are gone. What remains is the barn, the farmhouse, and the stone butcher/storage house. There is old farm equipment, tools, and other relics strewn around the property. We will be the 5th family to live on the homestead. For a few moments I thought I felt the first homestead gentleman looking over my shoulder at pictures with me. I wondered if he was re-living moments of long ago, or if he was curious as to whom was going to live on this land, and in this home that he and his wife built and obviously loved and cherished. 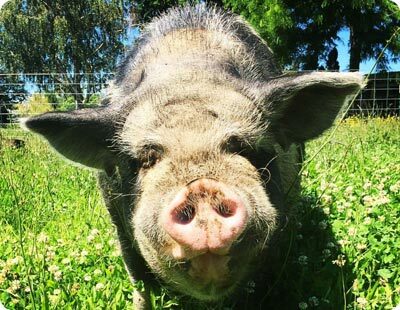 I find it somewhat ironic, or may be serendipitous, that what once was a farm that raised hogs, cattle, and chickens for consumption, will now have the same types of animals living on the same land, only to live their lives there in Sanctuary. It has even crossed my mind that maybe, just maybe there are animals waiting to come back here to heal their past lives and find peace in their soul. Isn’t a sanctuary a lovely tribute and addition to the rich history of this land? I am so very excited for our friends, family, and supporters to visit our place. It is one of the most peaceful places I have experienced and I am interested to find out if others feel it too.